Well, it’s the ninth year of Real Bread Week. Running from 6th - 14th May, Real Bread Week celebrates our love of Real Bread and exposing the horrors behind the industrial loaves produced by the millions everyday. It seems we are falling out of love with the industrial loaf as we are realising that this ‘product’ is full of cheap and nasty ingredients, highly questionable ‘processing agents’ and preservatives. The stuff is making us ill, hence the rise in gluten and wheat ‘intolerances’. The ‘intolerance’ is our bodies reacting to fast a production line of unfermented wheat and hard gluten. The wheat ferments in our stomachs and the gluten softens in the gut, no wonder we’re feeling uncomfortable. The industry also creates vast amounts of waste, which is something I only found out recently from a student who worked as a Production Manager at a large supermarket ‘bakery’. His stories were horrendous and he has never touched these loaves again – never mind feeding them to his children! He joined one of my recent Bread Making Classes and was struggling a bit to get a decent loaf. Leaving delighted with some tasty bread under arm, he couldn’t wait to get home and bake the kind of bread he dreamt he would achieve one day. This year we are focusing on Fougasse. Fougasse is a type of bread, not only known in the South of France, but also in other guises world wide. It’s a flat bread made with flour (usually white), yeast, water and salt – rather similar to it’s Italian equivalent, Focaccia. 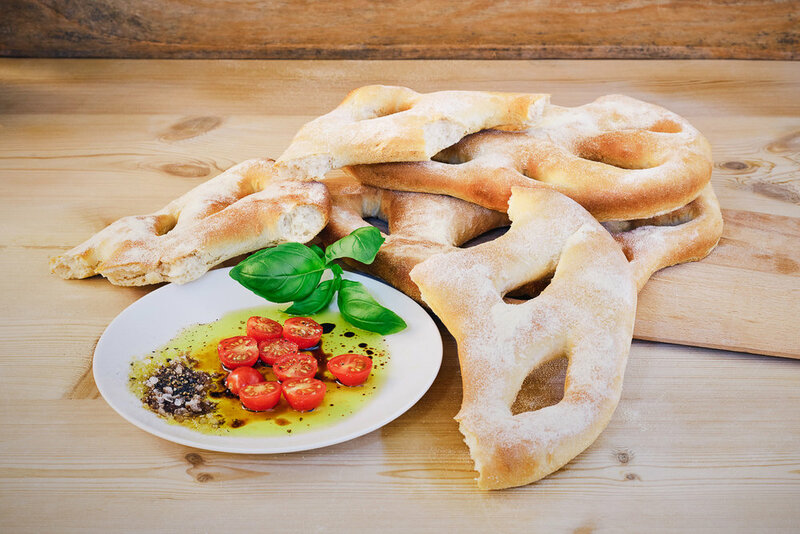 Fougasse is the perfect bread for sharing. The rather alien looking shape simply begs to be ripped a part then dipped in olive oil, lovely aged balsalmic vinegar – ooohhh getting peckish now – hummous, bagna cauda or any other dipping sauce your fevered imagination can cook up. Kids love making Fougasse too, particularly at Halloween when you can make spooky faces and call it Boogasse! It’s a tolerant dough, not relying on too much ‘rise’ which is vital to a conventional Boule, for example. Little fingers, used to Play Dough, require little tuition to make weird and wonderful Fougasse faces. Fougasse is usually a savoury treat, but you can replace olives with dried fruit or nuts. I’m including Fougasse in my Introduction to Bread Making Class on 7th May in celebration of Real Bread Week. Come in and smell the bread...and don't forget that healthy, honest bread requires 5 simple quality ingredients and loves to grow in 220ºc. Night of the Living Bread!